I flew over thunderstorms as I returned from the Iowa Summer Writing Festival a couple of years ago. The clouds contained lightning – I wondered if I was witnessing the birth of a world. When I was in college, I saw a short film about Surtsey Volcano – a volcano that erupted out of the ocean in Iceland in November 1963. The lava met the ocean and solidified, creating an island that hadn’t existed before. The film documented the work of the scientists who had come to the site to study it. They were on a small boat just off the island. At one point, they decided that the volcanic activity had subsided enough that a group could safely visit the island. There was an eruption as soon as the team reached the island. The crew aboard ship filmed the spewing rocks, visibility obscured by a cloud of volcanic ash covering the island, the narrator wondering if their colleagues were alive or dead. The activity subsided; the group returned from the island – safe and sound. They were shaken, but not with fear. Rather they were exhilarated by their experience. Their strategy had been to stay still until they saw a rock tossed by the volcano headed their way, and only then did they move. They did not blame the volcano for being a volcano. Nor did they try to conquer it. The let the volcano be a volcano, and danced with it. They found safety in trust and grace. As they prepared to leave, they contemplated the fate of the island, wondering if the island would survive the erosion by the ocean, expressing sadness that it might not. They filmed the sea gulls flying over the island, and then a tiny sprout of green emerging from the solid lava. The seeds dropped by the birds had taken hold. That gave them hope that the island might survive – the appearance of vegetation might be its salvation. Vegetation could be its defense against the energy of water. It’s been more than forty years since I saw that film. It was perhaps thirty minutes long – if that. 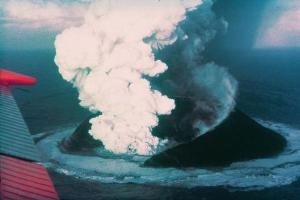 But it embedded itself into my consciousness with the ferocity of the vegetation on Surtsey Island. Photos of the current eruption of the Icelandic volcano stirred that memory. How can anyone see the photographs and not stand in awe? Do we need any further proof that change is constant and that we are not in charge? Just ask the stranded travelers. I think it might be important for us to pause for a moment and reflect on the enormity of this event. We are a part of something so much bigger than ourselves. Saturday was the fortieth anniversary of Earth day. I don’t think we need to worry about saving the planet – volcanic eruptions demonstrate that the earth will endure, with or without humans. But I think that our lives count – if for no other reason than the experience of being alive and taking in the wonder of it all. I think that the truth of the human condition is that we are at once alone and a part of everything. We are no more than that sprout of green that appeared on Surtsey Island, but that sprout of green was the sign that the island might endure. I think it’s important to rise above the fear I saw at the Tea Party rally I wrote about in my last post. I think I need to rise above my fear of their fear. If we can just remember that no one gets out alive, I think we might be able to move one step closer to a world where there’s enough room at the table for everyone. Note: Thanks to the Internet, I learned this morning that Surtsey Island survived. Okay, Rush Limbaugh does not see the volcanic activity with awe. He thinks it’s evidence of god’s anger that we passed health care reform. What a weird god that would be. That might explain Rush’s rather grumpy personality. This entry was posted in Following your bliss, Living, On Being Authentic, On Turning 60, Slaying dragons, Writing and tagged human condition, robert frost, surtsey, volcano. Bookmark the permalink. ← When God Hates the Same People You Do . . . I think we don’t know who we’re messing with. I think mother nature has some checks and balances up her sleeve that we can’t begin to predict. I think it is in our best interest to clean up our act, but I don’t think we are going to take the earth down with us. That Robert Frost poem really sums it up nicely. Well, change does seem to be afoot. We decided to get earthquake insurance . . . you know . . . just in case. Did I remember to ask how your query letter is going? regarding slush limbaugh: one needs wonder in one’s soul to know wonder outside of it. Limbaugh has no hero’s, he has no wonder in his soul, just conviction. Do you allow such post in your blog, Mrs. Hogan? If not, I do apologize. I do allow a post such as yours on my blog.